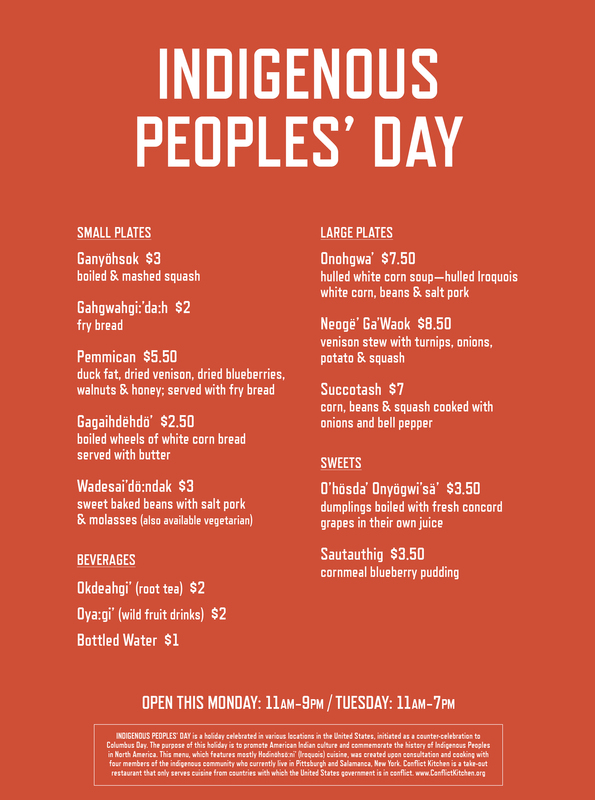 Stop by Conflict Kitchen to celebrate Indigenous Peoples’ Day. Dine with us for lunch or dinner Monday, October 12 – Tuesday, October 13 to sample the cuisine of four members of the indigenous community who currently live in Pittsburgh and Salamanca, New York. The menu concentrates on Hodinöhsö:ni’ (Iroquois) cuisine and will feature traditional Hodinöhsö:ni’ corn soup, venison stew, fry bread and root tea. 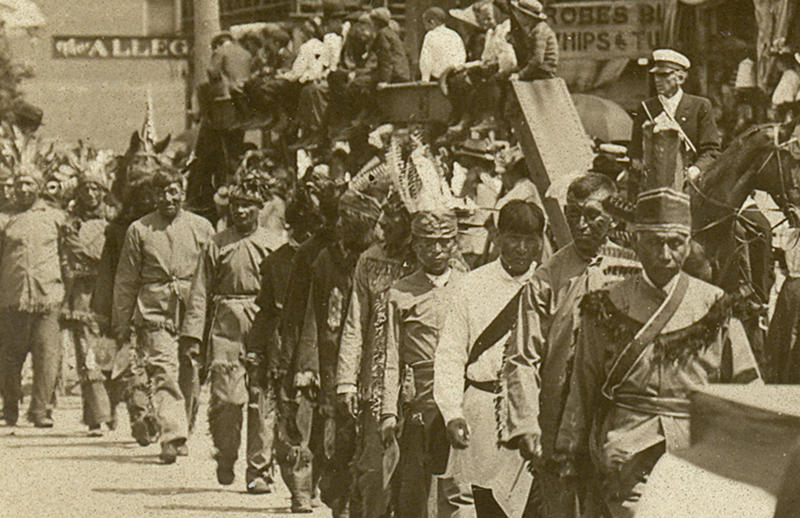 Additional events organized by Indigenize Pittsburgh include an afternoon screening of Kanehsatake: 270 Years of Resistance on Saturday, October 10 at the William Pitt Union, an early evening celebratory march through Oakland on Monday, October 12 and performances the same day by The Old Bridge Singers in front of Conflict Kitchen, beginning around 6 / 6.30p. Ruth Martial is a single working mother of mixed European and Hodinöhsö:ni‘ descent, a birth doula, a prisoner rights advocate and a survivor active in the movement to end gender-based violence. She is also a traditional gardener who seeks to draw attention to the ways that environmental justice and food sovereignty are key to every community’s ability to be self-determined. Ruth is an educator who has spoken on the harmful effects of racist mascotry in sports on Native American youth and the connection between the use of “Indian” mascots and violence against Indigenous Peoples at the annual KLT Conference on Environmental and Reproductive Justice. She is a member of Indigenize Pittsburgh, which works for the adoption of Indigenous Peoples’ Day on the second Monday in October by the City of Pittsburgh, Pittsburgh Public Schools and society at large. Eva Aidman is an enrolled member of the Seneca Nation of Indians (Deer Clan) and is gift shop and finance manager for the Seneca-Iroquois National Museum in Salamanca, New York. Eva has owned and operated two gift shops in Gatlinburg and Knoxville, Tennessee, where she sold a variety of gifts, including her own art pieces. Eva moved back to her Onöndowa’ga:’ community in 2001 where she resides in her great grandmother’s relocated home in Jonegano:h (Cold Spring). She has been employed as the Gift Shop Manager at the museum since 2006. Under her management, the gift shop has grown to include a variety of regional and global Hodinöhsö:ni’ artists. Her energy, outgoing personality and knowledge of Onöndowa’ga:’ artists and culture make Eva an essential part of the museum’s daily program. Terrylee Williams is an enrolled member of the Seneca Nation of Indians (Snipe Clan) who was raised on the Cattaraugus Territory. She earned a B.A. in Art History and Native Studies from SUNY Buffalo. While searching for a school for her daughter, she also found a career in Waldorf Education and became a Certified Lead Early Childhood Teacher. As a Cultural Specialist at the Seneca-Iroquois National Museum in Salamanca, New York, Terrylee is combining her teacher training and her studies of Hodinöhsö:ni’ culture. She is also a member of the Native Roots Artist Guild and enjoys doing Iroquois raised beadwork in her free time. The Old Bridge Singers are a Haudenosaunee drum group and traditional smoke dancers from the Allegany Indian Territories in New York state. Special thanks to the Seneca-Iroquois National Museum in Salamanca, New York, the culinary artists participating and Indigenize Pittsburgh.